Lawn Care Solutions has been providing professional lawn care and landscaping services in Buda, TX for several years, we have established ourselves as the leading lawn service company in the area by providing quality services. Lawn Care Solutions is able to handle all of your lawn mowing and landscape maintenance needs and we have a staff of professional and courteous employees ready to assist you. If you are in need of lawn mowing or landscape maintenance services for your home in Buda, Lawn Care Solutions can help you. We offer a 100% satisfaction guarantee on all of the services we provide and have no-hassle upfront pricing. Our team works hard everyday to ensure we provide the best service possible to our customers in the field and in our office. We also have Convenient online Billing tailored with consistent scheduling and on-time service. In addition to focusing on quality we also pay attention to the little details like closing your gate when we complete service. Our Buda, TX lawn mowing services include mowing the front and back lawn, line trimming around the house, fence and the obstacles on the lawn with a string trimmer, sidewalk and driveway edging and blowing off the front porch, back porch, and front driveway. You can choose between weekly and bi-weekly lawn mowing services based on how frequently your lawn needs to be mowed. Our most popular and recommended service is our weekly lawn mowing, weekly lawn mowing will keep your lawn looking great. If you are considering having your bushes trimmed, mulch replaced, or flowerbeds de-weeded, Lawn Care Solutions can help you. We are specialists in Buda landscape maintenance and have the experience and tools necessary to get the job done quickly. We make caring for your landscape easy give us a call to try our services out . Our mulch installation services are a fast and effective way to improve the appearance of your home while protecting your plants from the summer heat. 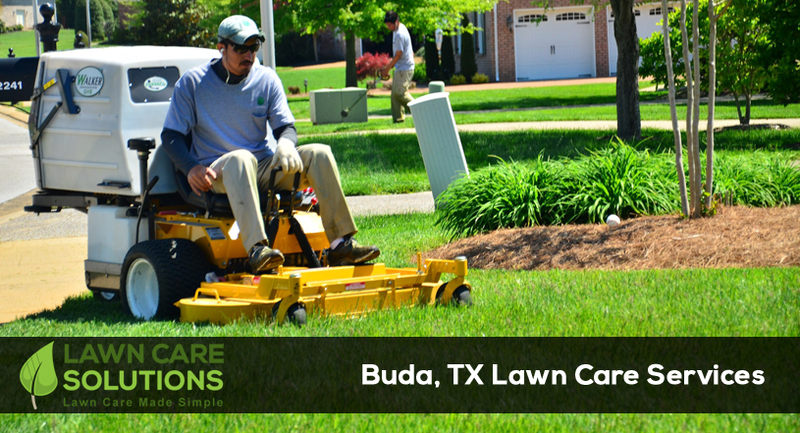 At Lawn Care Solutions, we have been serving the Buda community for years, and we want to earn your business. We can provide all of the lawn care and landscape services you need, and we’ll make sure that you love the results before we consider the job complete. To find out more about the services we offer and if we can help you with your yard, call Lawn Care Solutions today and request a free quote. Call us at 512-910-2680 today and we will be happy to discuss your lawn care needs and the advantages of choosing Lawn Care Solutions as your lawn care provider. We appreciate you considering Lawn Care Solutions as your lawn care service professional.